Eye-catching light mauve-pink, 4-6" flowers with red bars brighten up an arbor, fence or trellis. Medium green foliage adds texture and color. Manageable and easy care, clematis are a favorite vine for gardeners. 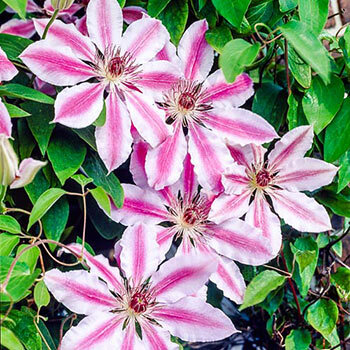 Bloom Time Blooms May-June and again in Sept.
Foliage Type: Opposite, occasionally alternate leaves that are simple to palmate with a medium green color. Bloom Time: Blooms May-June and again in Sept. Flower Form: Single 4 - 6" blossoms. 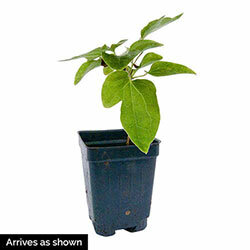 Planting Instructions: Set in ground at same level as growing in the pot. Plant by other low plants or mulch around base to keep roots cool and moist. Growth Rate: Slow to establish, fast once established. Pruning: Blooms on previous year wood. Light pruning to shape may be desired once plant is established. Late winter to early spring. Winter Care: Best given a winter mulch around their base. Remove early in spring before growth starts.